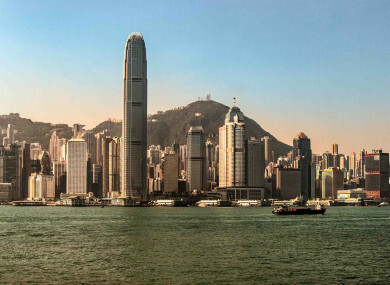 Hong Kong's famous skyline will be within reach for Irish travellers. HONG KONG’S FLAGSHIP airline is to begin direct flights to and from China, marking the first time Ireland will have a direct flight to the Asia-Pacific region. Cathay Pacific will begin the Dublin-Hong Kong route from next June and will operate the service four times per week. The airline’s website has the route available next June from €642 for a return flight. The flights will be into Hong Kong International Airport and will provide Irish travellers with more options for connecting travel within Asia. It will also provide a direct option for the estimated 4,000 Irish people who live in the former British colony. Dublin Airport’s managing director Vincent Harrison described the new route as “historic” and said today that it will also be a financial boost to Ireland given Hong Kong’s position as a regional business hub. “Dublin Airport is competing for routes like this with other major European airports, so winning this new business is hugely positive news for Ireland, for foreign direct investment, for Irish exporters and for inbound tourism,” he said. Harrison also said the new route has come about following negotiations involving the Irish Embassy in China as well as State bodies IDA Ireland and Enterprise Ireland. Trade between Ireland and China is estimated to be €8 billion per year with approximately 100 Irish firms having operations there. Tourism Ireland has also welcomed the announcement of the new route. Separately, Dalton Philips has been named as the new CEO of DAA, the company which operates both Dublin and Cork airports. Philips is a former chief executive of Brown Thomas and has further experience in the high-volume retail market having held senior executive positions in Loblaws in Canada, Morrisons in the UK and Walmart in the US. Philips has been appointed for a seven-year term and will take over from Kevin Toland, who has held the role since 2012. DAA’s chairman Pádraig Ó Ríordáin said this afternoon that Philips is joining the company at a particularly important point. “His leadership will be critical to DAA as we address the challenges of Brexit and the delivery of the north runway at Dublin Airport, while maintaining growth of our airports and the international businesses,” he said. Email “Ireland will soon have a direct flight to one of Asia's most famous cities ”. Feedback on “Ireland will soon have a direct flight to one of Asia's most famous cities ”.